A complex investigation of Bivol, based on documents from Bulgaria, USA, Liechtenstein and Dubai, exposed a scheme for large-scale smuggling of cigarettes, manufactured by Bulgartabac, in the Middle East. The scheme has been underway since 2004, and its heyday coincided with the height of Delyan Peevski’s career – the lawmaker and businessmen who became in 2013-2015 the focal point of the backstage rule in the State – the so-called model “WHO”. 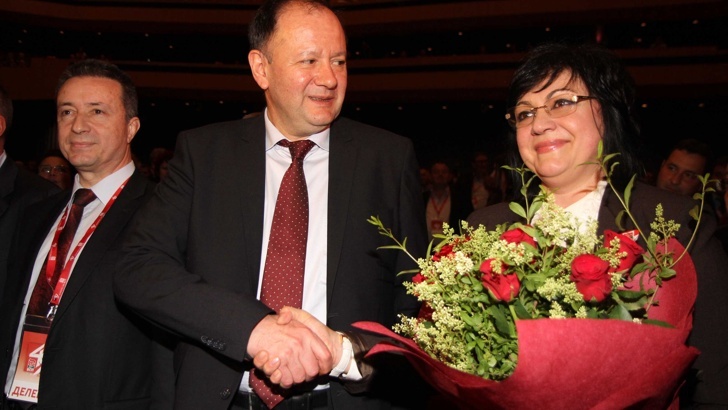 Kornelia Ninova, the just elected new and first female leader of the Bulgarian Socialist Party (BSP) is also among the “insiders” as she has been Chair of the Board of Bulgartabac Holding during the government of the Triple Coalition. She retained this post even after she was dismissed from her other post of Deputy Minister of Economy and Energy in the midst of a huge scandal involving the Minister of Energy and Economy at the time – Rumen Ovcharov, the then-Head of the National Investigation Service, Angel Alexandrov, the Head of the Sofia Heating Utility Valentin “the Heat” Dimitrov and businessman Krasimir Georgiev, who was a college classmate of Ovcharov. The other person fired together with Kornelia Ninova was Delyan Peevski, who was then Deputy Minister of the State Policy for Disasters and Emergency Situations. An investigation was launched against Peevski for blackmailing another Bulgartabac boss – Hristo Lachev. “The only pressure that has been exerted on me came from the former Deputy Minister of State Policy for Disasters and Emergency Situations, Delyan Peevski, and from Angel Alexandrov,” Lachev said then. The exchange of accusations between Rumen Ovcharov and Angel Alexandrov revealed that Bulgartabac Holding was investigated for draining of funds. Subsequently, however, the investigation was hushed and ended without charges, while Delyan Peevski was reinstated to his post. At that time, the smuggling schemes were going through Hristo Lachev through the offshore “Caledon Invest” and two dummies. In June 2007, the Bulgarian Prosecutor’s Office opened an investigation into smuggling and money laundering, which specifically cited “Caledon Invest” and Lachev. The indictment of Prosecutor Iliev stated that Caledon has purchased a large quantity of cigarettes of the Bulgartabac brand “Prestige” for smuggling purposes. According to the dummies (managers of Caledon) who were charged, all documents for the export were prepared by… Bulgartabac. In Bulgaria the investigation is classified, but documents, detailing this investigation, were sent to the USA. This happened due to a US court order to disclose the true owners of “Caledon Invest”. Bivol was the first one to find and publish these court documents that are public in the USA. At the same time when the investigation in these serious allegations was underway, “Caledon Invest” was the official distributor of the production of Bulgartabac in the Middle East. The fact that Bulgartabac had a contract with Caledon is listed in the documents from the investigation against Caledon in 2007, together with Iraqi national Salam Quader (Quadir) Faraj. A second document, confirming the partnership between Bulgartabac and Caledon, is an official letter signed by two directors of Bulgartabac in 2011. This letter also contains the name of Salam Quader Faraj, also known as “Mullah Salam”, who is one of the biggest smugglers of cigarettes in the region. He was the exclusive distributor for the brands “Prestige”, “Victory” and “MM” in Iraq and the Middle East. So, while the exclusive distributors of Bulgartabac brands for one of its biggest markets were dealing with smuggling and money laundering from this criminal activity, and while Bulgartabac prepared the documents for the illegal export, the Chair of the Board of the Holding was… Kornelia Ninova. She left that post only in July 2009. The pressure exerted by Delyan Peevski on Hristo Lachev was actually over the distribution of profits from the smuggling schemes and their control which happened after the privatization of the Holding. Bulgartabac continued to deliver cigarettes to Salam even after the Iraqi authorities took away his license for import of cigarettes in Iraq (see here). An official representative of the Iraqi government confirmed to Bivol that to date Faraj has no license to import cigarettes. At the same time, Bulgartabac refused to work with other companies that provided guarantees that they can carry out legal import in Iraq (see here). After the privatization in late 2011, the new backstage owners of Bulgartabac continued to work with Faraj. The investigated “Caledon Invest” was “retired” and closed in 2013 due to non-payment of the annual fee. Salam, however, continued the same pattern through his other business – the company Andalus Al Sharq registered in Dubai (see here). Just in 2014, Andalus has purchased more than 600 million boxes of cigarettes primarily from the brands “Prestige” and “MM”. The profits from their sale on the black market in Iraq and Turkey amounted to over 1 billion US dollars. Besides smugglers generating huge profits, this traffic is particularly risky, because a fee is paid to terrorist organizations like PKK and other banned formations to use the illegal routes. The cigarettes are transported through territories controlled by DAESH. Because of financial flows to banned organizations that smuggling is closely monitored by Western special services, a diplomatic source, speaking on condition of anonymity, confirmed to Bivol. The main victim is Turkey, which is losing huge amounts from the non-taxed illegal imports. Last year, Turkish authorities listed Salam Quader Faraj as a smuggler and arrested in the port of Mesrin huge shipments of Bulgartabac cigarettes. The owners of Bulgartabac are among those profiteering from the smuggling. One of them was the exiled banker Tsvetan Vasilev, who is now claiming publicly that the majority shareholder in Bulgartabac is lawmaker and media mogul Delyan Peevski through his mother Irena Krasteva. Another indisputable outcome of this investigation is that the State has been cheated in the privatization of Bulgartabac. Officially, the deal was with the Russian bank VTB, but in fact the bank has previously negotiated the money to be paid by offshore companies registered in Liechtenstein (see here). The payments came from companies in Dubai (see here), represented by the Executive Director of the Holding, Ventsislav Cholakov. There are reasonable doubts that the State received as payment more than 100 million euro with criminal origin, laundered through the bank VTB. Who is really standing behind the companies in Liechtenstein and Dubai is a secret jealously guarded by the Financial Supervision Commission and the Commission for Protection of Competition. Recently, Bivol was able to prove that one of the Dubai companies has as listed shareholder attorney Alexander Angelov (see here), a figure from the closest circle around Delyan Peevski. The investigation in the backstage ownership of Bulgartabac continues and is a primary task for the team of Bivol due to evidence that besides Peevski, “Mullah Salam”, himself, has become a co-owner in Bulgartabac, along with Ahmed Dogan, Honorary Lifetime Chairman of Peevski’s party Movement for Rights and Freedoms (DPS) and with current second-term Prime Minister Boyko Borisov, who according to financial journalist Miroslav Ivanov, received a commission as their reward for the political blessing for the privatization of Bulgartabac, which was passed in the Parliament in late 2011. In the shorter term, the information and evidence revealed by Bivol give cause for review and cancellation of the privatization deal after the sudden collapse of Bulgartabac’s production and the layoffs in its factory. The reason – illegal trading activities which is a gross violation of both, the privatization contract and international trade agreements to which Bulgaria is a party.